A client attempted to cold forge a steel part with a flange, but wasn't getting the desired results. Consequently, they turned to THE LAB at Ambrell to see if hot forging would meet their time and quality objectives. Their goal was to heat the part to 1800 ºF (982 ºC) within 30 seconds. A specially-designed single position multiple-turn helical coil was designed by THE LAB for this application. Heating took approximately 20 seconds, which was 10 seconds less than the client's goal. 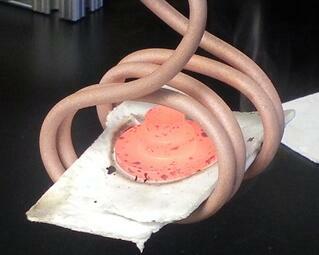 An Ambrell EASYHEATTM 5kW induction heating system was used for this application. Induction heating's rapid speed, precision and Ambrell's ability to design a tailored solution thanks to complimentary applications testing from the experts at THE LAB led the client to choose Ambrell.